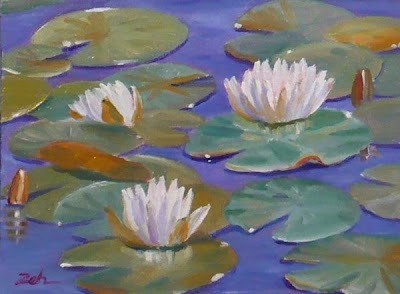 I took a long walk down to the Nature Preserve the other day, and was delighted to see the lilies blooming on the pond. All the yellow buds had opened into white blooms. Couldn't wait to do a painting of them, so here it is! It was a gorgeous day; you can see the sun sparkling on the wet lily pads.